Comfort foods. We all have them. And as long as it’s done in moderation, I am all about them. I mean God gave us tastes buds for a reason. 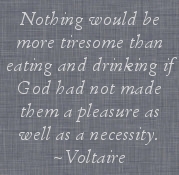 If food’s sole purpose was nourishment, why make so many different tastes and aromas and textures? Because He wanted us to ENJOY it! Food can be an almost spiritual experience. Our favorites can make even our worst days feel instantly better. If I’m having a rough morning and you bring me a mocha or some cheesecake, we’re pretty much going to be BFFs for life. That’s how food works for me. Let’s get real, that’s how food works for most of us. 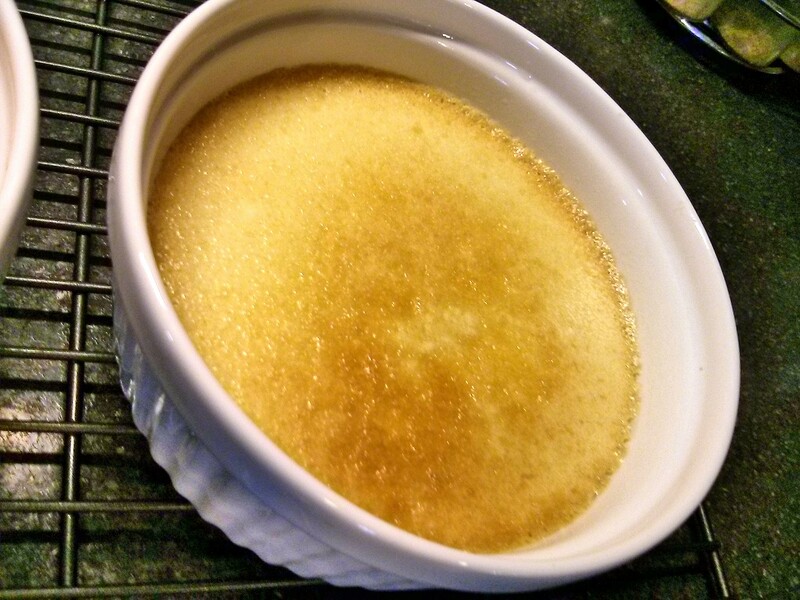 I wish I had known 20 years ago how quick and simple crème brûlée is to make. Mind you the whole process takes a few hours, but the parts that involve you actually doing stuff is only about 15 minutes all together. I think we all have 15 minutes to devote to creating this indulgence. Totally worth it, I promise! Most of the store-bought crème brûlée mixes I’ve seen have caramel coloring in them (plus a lot of extra junk that is completely unnecessary). It’s also not a whole lot faster. So this is a dye-free version you can safely enjoy with the kids. If you feel like sharing with your kids…I’ll be honest, we usually don’t. We might be terrible parents. Jury’s still out. 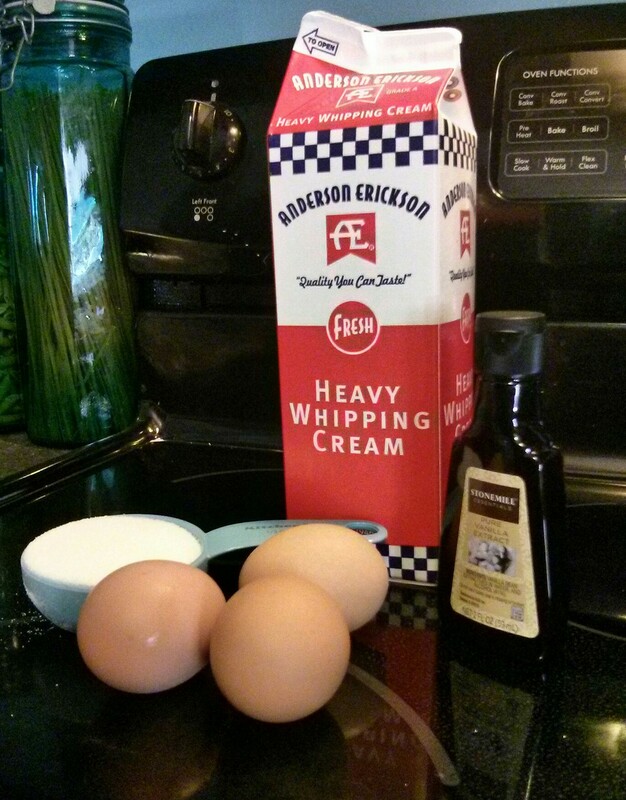 Anyway, sharing or not, all you need are these four ingredients: heavy cream, vanilla, egg yolks, and sugar. This recipe is for two (because, like I said, it’s usually just for us), but can be easily doubled or tripled if you like. 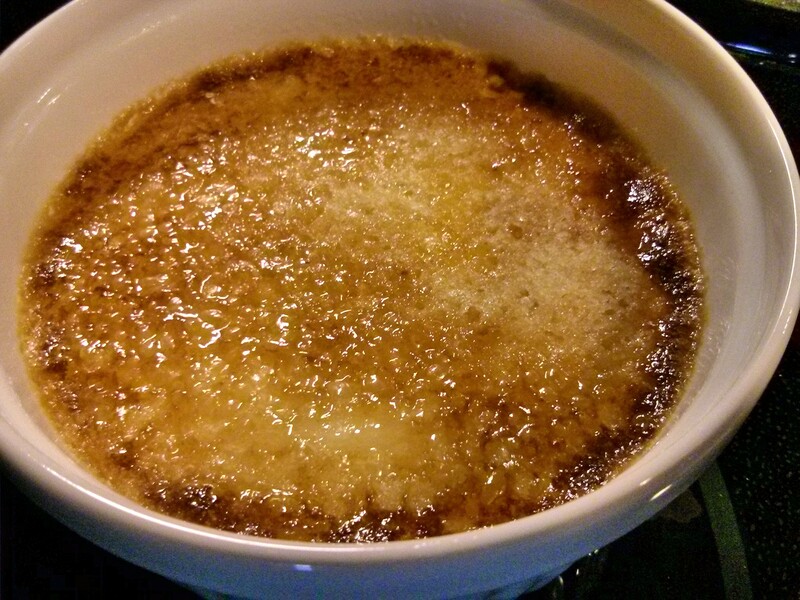 Crème brûlée is an awesome dish to whip up for dinner guests. It keeps well in the fridge for up to 4 days (just save the caramelizing step for when you’re ready to serve it). So make it ahead of time and then impress the heck out of your friends with dessert. They’ll love you for it. You’ll love you for it. Everybody wins. Yay! Now, on to the recipe. First, preheat your oven to 325 degrees. 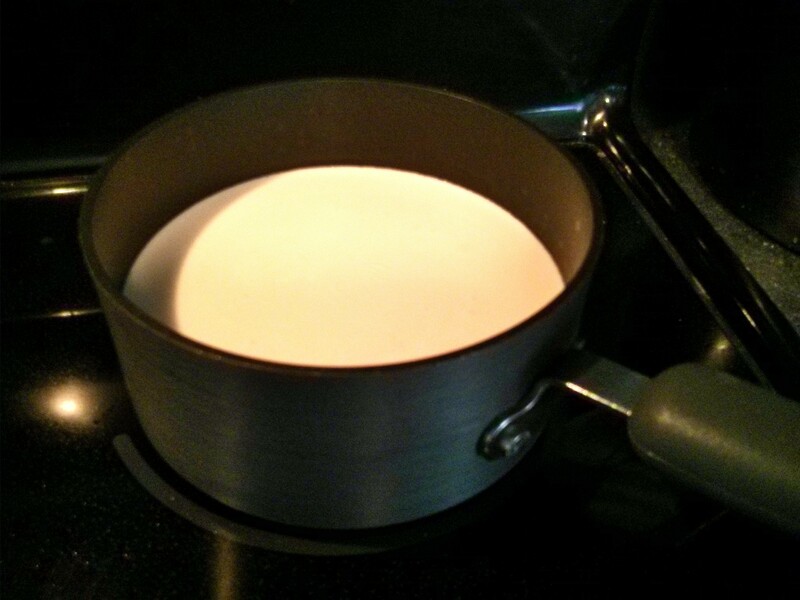 Bring a pint of heavy cream and a teaspoon of vanilla to a simmer in a saucepan over medium heat. When it has just started bubbling (usually takes 6-7 minutes), remove it from the heat and allow it to cool down for around 10 minutes. For the record, I do other things like dishes, dealing with kids, etc during these in-between waiting times. It makes it feel like a quicker recipe when you’re not just standing at the stove waiting for stuff to happen. 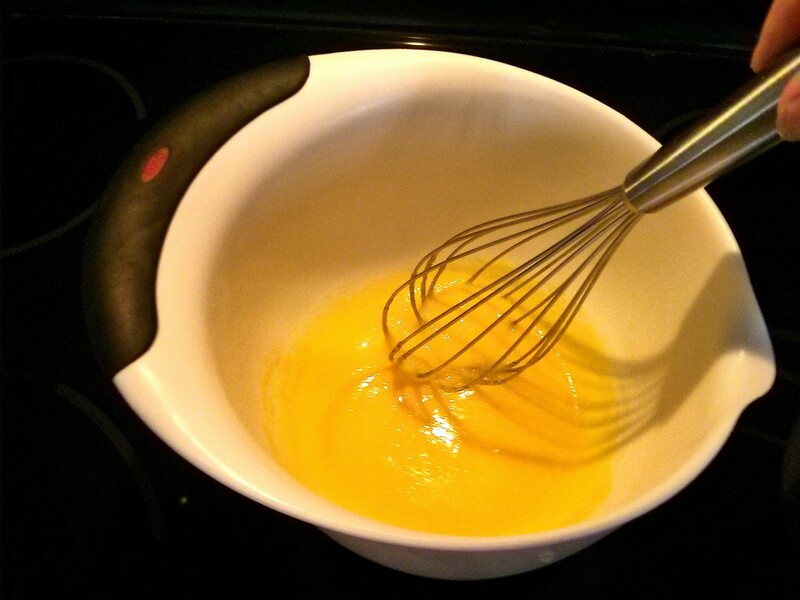 While the cream is cooling, whisk together 3 egg yolks and 1/3 cup of sugar. If you want to flavor your crème brûlée (with orange, lavender, lemon, cinnamon and so on) add what you want to this mixture now. One of my favorite variations is chocolate; just mix in a half tablespoon of chocolate powder. If you’re still waiting for your cream to cool, you can go ahead and prepare the ramekins and water bath. 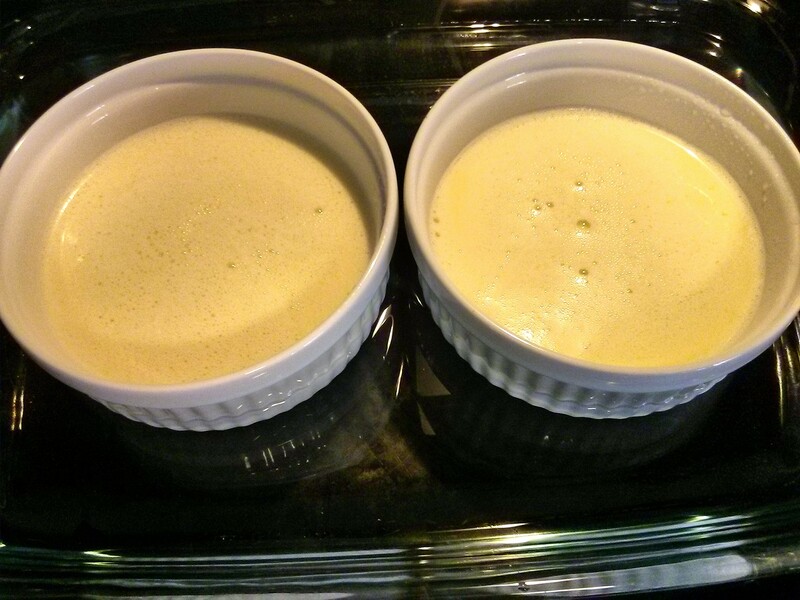 Lightly grease a couple ramekins with coconut or olive oil (6 to 8 oz ramekins work well for two servings). Place them in a glass baking dish, then fill the dish about half way up with hot water. If you get it too full, it will be difficult not to spill as you move it in and out of the oven. You want the water to be at least a third of the way up the side of the ramekins, like mine pictured below. 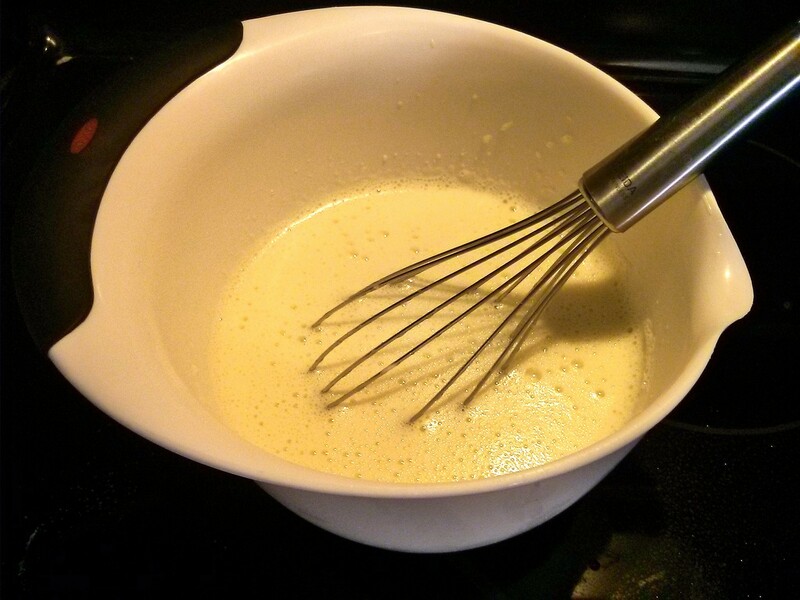 Next, mix your cream and egg mixtures together, stirring until well blended. Pour this mix into your prepared ramekins, and put the whole water bath in the oven. Bake it for about 40 minutes. You want it to be set, but still a little jiggly in the middle. When it’s done, take the water bath out of the oven. Let the whole thing cool to room temperature (about an hour) before you remove the ramekins. They look like this when they’re done. 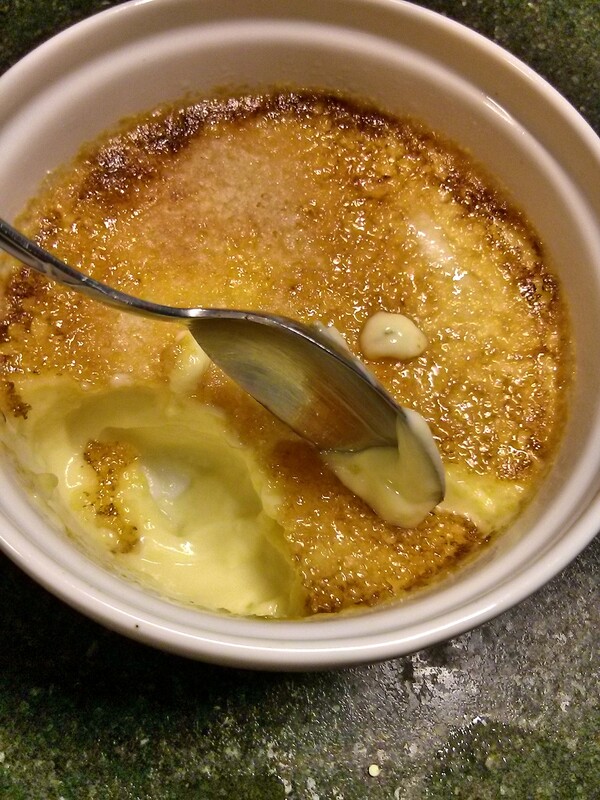 If you like your crème brûlée warm, then serve them now. If you want it to really set up and chill properly, then cover the ramekins with saran wrap and stick them in the fridge for at least two hours (or overnight if you’re making it ahead of time). That’s all there is to it if you want it plain (and yeah, sometimes we do, because we just can’t wait!). But, after all, crème brûlée means “burned cream” – and it’s just not the same without that caramelized sugar to top it off. Now, you can get all fancy and buy a mini blow torch or a tiny branding iron to do this part, or you can do it the not-cool way (like me) using the broiler in your oven. 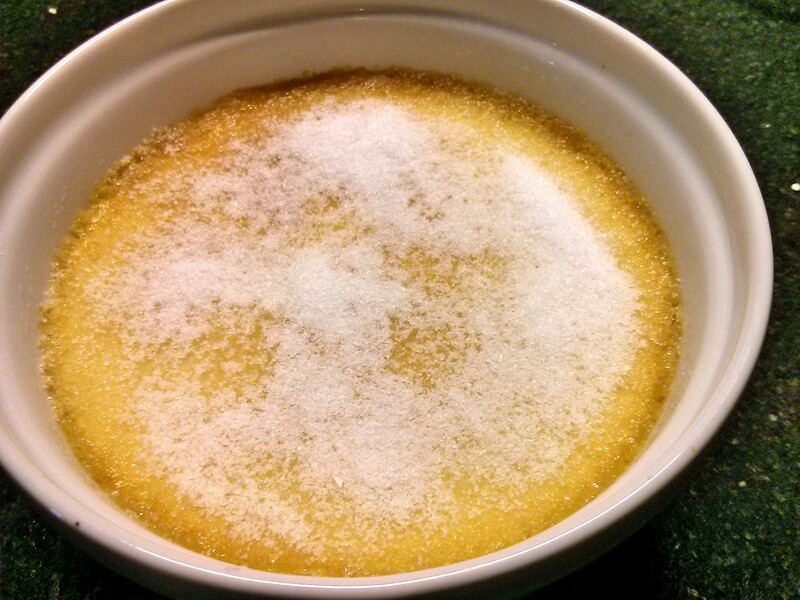 Cover the surface of your crème brûlée with sugar. Stick it in the oven about six to eight inches away from the broiler. It doesn’t take long for the sugar to caramelize, only two or three minutes. Keep a close eye on them, and turn the dishes if necessary so they caramelize evenly. I doubt that truly “burned cream” tastes very good; so take them out when they start to look burned, don’t leave them in long enough to actually be burned. 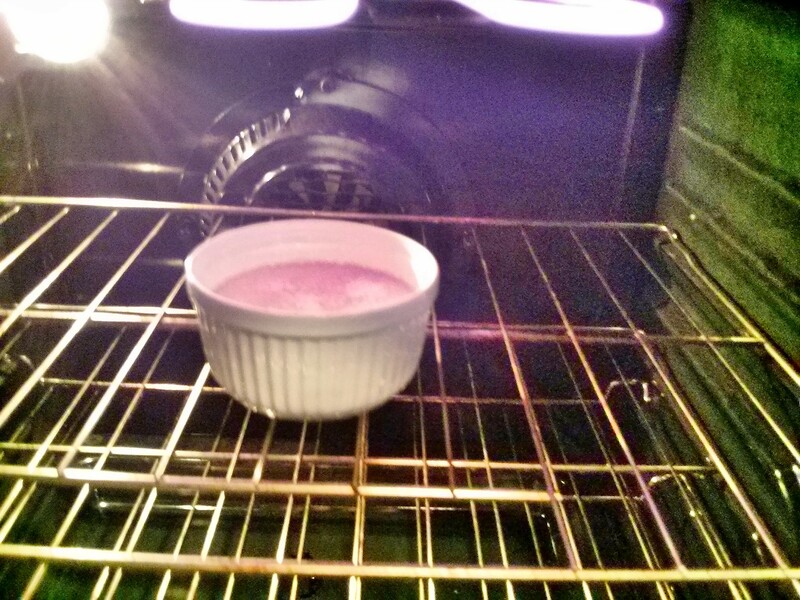 **Important note** If you had your ramekins in the fridge, let them warm up on the counter for at least 30 minutes before you put them under a broiler or they may crack. Ahhh, cinnamon. We all know it smells amazing. But did you know it’s really good for your brain too? Just a whiff has been shown to boost your memory, attention span, and visual-motor speed. I don’t know about you, but after a long day with the kids I could sure use some help in those departments. Truthfully, with an infant in the house, some days I need help all day. We’ll sprinkle it in our coffee grounds or on our oatmeal in the morning to help us wake up. And that’s just the smell. Now if you actually eat cinnamon you get even more health benefits. It has amazing anti-viral and anti-microbial properties (traditional Chinese medicine has long claimed ingesting cinnamon is one of the best ways to ward off a cold). It also helps control your blood sugar levels by making the stomach empty more slowly after meals. That means your blood sugar won’t spike so dramatically; in fact, some studies have shown it to be more effective than certain diabetic medications. Alright, let’s get cookin’ on this delicious, dye-free, cinnamon-filled French toast casserole. Preheat your oven to 375, grab a 9″x13″ baking dish, and gather your ingredients: bread, milk, eggs, butter, berries, vanilla, salt, sugar, and cinnamon. You’ll need somewhere between a third to half a loaf of bread. Any bread will do. French toast was originally developed for using up stale bread, which you can usually get super cheap at grocery stores and bakeries. (Midwest friends, Jimmy John’s day old bread is only 50 cents a loaf! Yum!) I usually use whole wheat sandwich bread, because it’s what we have on hand. Tear up your bread into roughly square inch large pieces. Put the bread into your greased baking dish. You want it to be full to the brim, but not much higher than that since it will puff up a bit while baking. Next, whisk 6 eggs with 2 cups of milk until well blended. Stir in a 1/3 cup of sugar, 1 teaspoon of cinnamon (you can adjust this amount depending on how strong a taste you want), 1 teaspoon of vanilla, and 1/2 teaspoon of salt. Pour your egg mixture over the bread. Now press the bread into the egg mixture (I use the side of a measuring cup or a spoon so my hands don’t get dirty). You just want all the bread to be wet. Let the bread soak in it’s little egg bath for at least 10 minutes. While you’re waiting you can put on the topping. Sprinkle a couple tablespoons of sugar and about two teaspoons of cinnamon evenly over the top of the casserole. Then dot the whole thing with little pieces of butter. If you use a spreadable butter for this (versus a stick of butter) it’s much easier. Finally, shower on some berries. Fresh or frozen. Any kind you like. They all work. Or you can omit the berries. Or use nuts instead. Or use both berries and nuts. Get crazy! You can do all this the night before if you’re making it for breakfast. Just make sure you let the dish sit out on the counter for at least half an hour, so it can warm up a bit before you throw it in the hot oven to bake. Otherwise it may crack. Once your oven is hot and your casserole has had adequate soaking time, pop it in the oven. Let it cook for about 40 minutes. It should puff up a couple inches above the brim of the dish, and the sides will be a nice golden brown when it’s done. Serve it while it’s nice and hot. This dish smells SO good! I’m salivating just thinking about it. Plus, your house will smell wonderful and everyone in it will get a little brain boost to defeat that late afternoon drag. Win-win-win. I try to get the egg mixture made and the bread torn up during nap time. Just keep the egg part in the fridge until you’re ready to assemble the rest. Saves some time. You can even go ahead and make the whole thing during nap time and put it in the fridge until later. As I said before, just remember to let your dish warm back up a little before you put it in the oven. My favorite side for this dish (okay, for anything) is bacon. What’s handy is I realized that if you bake your bacon on a foil lined baking sheet at 375, it is done in roughly the same amount of time as this casserole. It was meant to be. To cut out the nitrates in bacon, get an uncured kind. I buy Farmland All Natural Uncured Bacon (Hy-Vee) and Simply Nature Applewood Smoked Uncured Bacon (Aldi’s). Both are great….but is there really such a thing as bad bacon? Other stay at home mamas will feel me on this one. It’s 11:45 AM, you’re going about your morning doing all your usual mama stuff (folding laundry, wiping butts, splitting up fights, picking up toys, making appointments, feeding the baby, washing dishes, answering your 100th “why” question of the day, possibly even getting ready yourself). Suddenly you’re bombarded with urgent cries of I’m hungry! When are we going to eat?? Yep, it’s lunch time. How does it always sneak up on me like that? I never have anything planned. Shoot…. BUT, the beauty of going through all the work of creating a dye-free kitchen, is that anything I dig out and throw on a plate for the kids is going to be safe for them to eat. Saves a lot of time and worry if you don’t want your kids to have food dyes. Here’s a sample of what my kids have been eating the last couple weeks. Turkey (Simply Nature uncured turkey from Aldi’s) and provolone with mayo, carrots and strawberries, Annie’s Chocolate Bunny Grahams, and almonds. Turkey, Ritz crackers, almonds, carrots, blueberries, and some cottage cheese. Peanut butter and jelly, salami (because they LOVE it and always ask for “just one piece!”), a clementine, cherry tomatoes, blueberries, and some Stauffer’s animal crackers. Alright this lunch was from the weekend, which is why it’s a little (but not much) more time intensive than our other lunches. 🙂 Van de Kamp’s fish sticks, cantaloupe, mixed nuts, and a Nature Valley Oats N’ Dark Chocolate granola bar. Peanut butter and jelly sandwich (yes, again…it’s easy! ), a mozzarella cheese stick, a clementine, and a bunch of mixed nuts. By now you’re probably getting the general pattern of what I throw on a plate for the boys. Nuts, fruit/vegetables, a sandwich or some meat, usually something from the dairy group as well for protein. They may not be fully balanced meals, but I think overall they’re healthy. My kids also have a mid-morning snack with fruits and nuts and proteins, so their lunches aren’t usually huge. This was our Valentine’s Day lunch. A heart shaped Nutella and raspberry jelly sandwich, heart shaped bananas, strawberries, mozzarella cheese stick, almonds, a Fit & Active fruit strip (from Aldi’s), and some Brookside dark chocolate candies. I know it’s nothing revolutionary, but I see that as a good thing. Just more proof that going dye-free doesn’t have to be complicated. Anyone can do it. I just had to share this. It was too good not to share. I’m talking about Swanson 100% Natural Thai Ginger Broth. I happened across this new dye-free convenience food while grabbing some beef stock for my French Dips the other day. My husband lived in Thailand for a while, and is obsessed with the food. So I had to give it a try. I promise this is not an ad. I am in no way affiliated with Swanson’s or Campbell’s. 🙂 I just genuinely LOVED this soup. And it really is all-natural as advertised. Check out the ingredients list for yourself. My husband, being the Thai food connoisseur of our household, was a bit skeptical that it would taste authentic. We tried it tonight. He gave it a big thumbs up. Even the kids liked it, though they complained that it “hurt their tongues” a little at first. It was spicier than most other foods I make, but I wouldn’t categorize it as spicy. Had just the right amount of heat to it. They still ate it, and even said they liked it afterwards. So good job, Campbell’s. It was also really easy to prepare. I happened to have all the ingredients on-hand, so that worked out nicely. Plus it was an excellent way to use my leftover shredded chicken. Took about 20 minutes altogether to prepare. Here it is in all it’s delicious goodness. Mmmmmm…I can still smell it. If you’re not in the mood for soup, you can use this broth to make other recipes too. The Campbell’s Swanson website has more recipes. Apparently, they also make two other flavors: Mexican Tortilla, and Chinese Hot and Sour. Looking forward to trying those. Now, don’t feel like you have to make French dips with this beef. Even if you do, there’s usually plenty left over to use in other dishes later in the week. The meat is just lightly seasoned (you can also not season it at all and have it turn out just fine), so it’s very versatile. It’s great in beef stroganoff, enchiladas, stirfry, and more. Almost any dish calling for ground beef can use this meat instead. Cutting out the time of browning ground beef makes preparing meals that much less troublesome. First, grab your ingredients: 3 lbs of bottom round roast, beef stock, and seasoning if you’re using it. I use onion powder, garlic powder, Tony Chachere’s Creole Seasoning, and Lowrey’s Seasoning Salt. **Watch out for artificial colors and MSG in the stock and any seasonings you choose. Pretty common to see those in these items. Cut the meat in half and place it in your slow cooker. I like to put a little of the stock in the bottom of the pot before I put the meat down, just to ensure nothing sticks. Makes cleanup much easier. Cover the meat at least half way up with beef stock. If you want to save money (I do!) then just use water for the rest. Whatever you decide to use, fill the pot until the beef is mostly covered. Sprinkle on your seasonings. I use about a teaspoon of each of mine. Give your stock a little stir if you’d like, but I usually don’t and it all blends together just fine. Put the cover on, set your cooker for at least 6 hours (medium-high heat), and walk away. You can make it in 4 hours, but it’s not quite as tender or flavorful as I prefer. After the allotted cooking time, grab a couple forks and pick up one half of the meat. This cut of meat usually as a “fatty side”, but it scrapes off easily. Once you remove the fat, start shredding. I recommend shredding all of it right away while it’s warm, because it just falls apart. Takes literally two minutes to shred all three pounds. It’s slower going once it’s been refrigerated. That’s it, folks! Five minutes of work and you’ve got a big ol’ pile of beef to do with as you please. To make the French dips, all you need are some hoagies and cheese. I usually add some sweet bell peppers too. Last year while learning to make different kinds of bread, I found this great recipe for homemade hoagies over at Amy’s Cooking Adventures. I’ve been making them ever since. They are so simple! And they freeze well (that’s the definition of a real winning recipe in my book). It takes less than a minute to heat them back up in the microwave. Love that fresh bread smell! Perfection! Store bought hoagies are awesome too. I’ll buy a bag if we’re having a lot of people over and I don’t have enough hoagies left in the freezer. Whichever you’re using, cut them length-wise and lay them open on a baking sheet. Put your meat on one side of the roll and your cheese and veggies on the other side. You can also butter the inside of your bread first if you want some extra flavor. Now pop that tray in the oven on one of the lower racks so the bread doesn’t burn. Keep an eye on it. It only takes a couple minutes to cook. When the cheese has melted and the bread starts browning around the edges it’s done. You can ladle some of the stock straight out of the Crock Pot to use as au jus. Most store bought au jus mixes have caramel coloring in them. This is a simple dye-free alternative. Add a few sides and you’ve got a super fast, delicious French Dip dinner. Seriously, I can’t imagine cooking chicken being any easier than this. I feel like it hardly qualifies to be called a recipe; it’s only two ingredients. The best part is you can use the meat in lots of different meals. And, of course, it’s dye free. Let’s get to it. Gather your ingredients: a bag of frozen chicken and some salsa. We usually do three pounds of chicken and use a 16 oz jar of salsa (all the salsas I’ve seen are dye free, but always double check). I’ve also done only two chicken breasts with a 1/3 cup of salsa in a tiny crock pot and it works just fine. Tailor it to your needs. I, personally, love having leftover meat to quickly throw into a dish later in the week, so I make a lot at once. Get out your crock pot. Pour in the frozen chicken. Now cover the chicken with the salsa. Put the lid back on and set your slow cooker for however long you want. I’ve done it on high for 4-6 hours and on low for 8-10. Everything turns out the same. Time it so it will be done cooking a little before you want to eat. I threw this together at 9:00 AM, so I did 8 hours since we usually eat around 5:30 PM. But I’ve also started it at 1:00 PM and cooked it on high for 4 hours and it was perfectly done in time for dinner. Don’t be afraid to try it at the faster cooking time. I won’t lie to you. This doesn’t look extremely appetizing while it’s cooking. After a couple hours it’ll look like this. When your chicken is done cooking, it’ll look like this. Still looks a little weird, but hang in there things are about to get pretty. Now get out a bowl and a couple forks. You’re going to shred your meat directly into the serving bowl, because why make extra dishes? Use the forks to carefully transfer a couple chicken breasts to the serving dish. I usually scrape the chunks of salsa off ours a little while it’s still in the slow cooker, but you don’t have to. Now use your forks to pull the meat apart. When the chicken is warm it shreds easily. I shred all of mine and then store any leftovers in the fridge for later. It’s not as fast to shred it once it’s been refrigerated. That’s it! Use your shredded chicken however you’d like. The first night I usually make chicken tacos – set out some fixin’s and tortillas and you’re good to go. I like making pasta dishes or sandwiches with what’s leftover later in the week. The meat has a really nice flavor, but you can also spice it to your taste as it’s cooking. For example, if you want to make ALL of it into taco meat, you could add a package of taco seasoning (a safe, dye-free option is McCormick) along with the salsa and then cook it. If you make three pounds of chicken taco meat, you can easily feed a large group. It’s great for a quick dinner when you’re having company, but have tons of other things to do (like clean your house, take care of the kids, etc). Here’s a glimpse at the delicious chicken tacos we had for dinner last night. Taco nights are the best, because the kids eat so fast. No complaining, no stalling; just the beautiful sounds of chewing. I hope you enjoy it as much as we do!